'Tyler's Shore Shack' offers all the comforts of home, plus plenty of perks for an awesome vacation in our beautifully furnished 3 bedroom luxury condo in gated community. You will be nestled back into Point Washington State Park and only a five minute walk to the sugar-sand beaches. The modern kitchen has granite counter-tops, stainless steel and opens to the dining and living area, which boasts a 50' flat-screen/ blue-ray DVD. The master suite has a luxurious king bed, expansive master bath, 42 inch TV with a blue-ray DVD. The second bedroom is well appointed with a queen bed, 32 inch flat screen TV/DVD. The bunk room has full over full bunk beds with numerous built in drawers and a 20 inch flat screen as well. We provide a fully-equipped kitchen, stackable washer/dryer, cable, free Wi-Fi and subscription to streaming Netflix through our Wii gaming system, beach/pool toys, floats, umbrealla and chairs, board games, Charcoal Grill (barbeque), No Smoking. For those who may fly in with a child, we also have a high chair, a pack-n-play, a stroller and a car seat for your convenience. Family First !! Our three sons have reached the ages of 19, 20 & 23 in the mere blink of an eye! We also now have a 3 year old daughter! Loving, laughing, and making lifelong memories is what our time at the beach is all about. It is our hopes that sharing our home will bring you more of the same! We vacationed in this complex for three years before we purchased our own condo. We love the privacy that Seagrove Highlands offers, as well as the location; we are a five minute walk to the beach, Tom Thumb convenience mart and five minute drive to Seaside. We are directly between Destin and Panama City Beach. A short bike ride to Seaside and Watercolor. Seagrove Highlands borders the Point Washington National forest and Mira Lake to provide a unique solitude on 30-A. Amenities include private screened-in porches, a clubhouse with a fishing pier on the lake, a swimming pool, and walking trails. Full Netflix subscription...download any movie your heart desires. The area was wonderful. More crowded than we expected. Was a little disappointed in all the chairs and umbrellas to rent on the beach. The rental chairs left no room for anyone else on the beach. We felt rude setting up in front of the rental chairs but there was no place else unless you set up way in the back part of the beach on the hot sand. The condo was in walking distance to the beach and the beach cart and chairs provided at the condo was wonderful. There are seversl steps when you get to the beach so be prepared. The beach access was easy to get to from the condo. Having the beach storage closet outside the unit was also nice, it kept the sand out of the condo. We enjoyed the fact we were close enough to Panama City Beach and Destin to go dine and shop. The only negative would be the furniture covers on the couch and loveseat. They always seemed to be falling off. We would definitely rent the condo again. My girls loved feeding the turtles by the pool and seeing all the frogs and lizards around the building. My family and I really enjoyed ourselves. The condo had everything we needed. My family and I really enjoyed ourselves. The condo had everything we needed. Not a very far walk to the beach either. The condo also included things for a baby like a bed, and a high chair. If you want a nice place to stay this is it. We had a great stay at Seagrove Hidhlands. 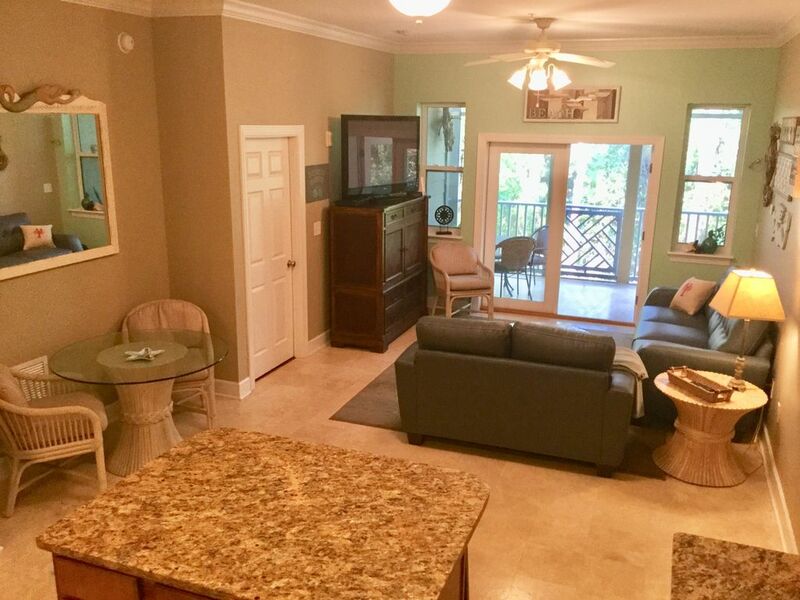 The condo is centrally located on 30A and walking distance to the Tom Thumb where you can get anything you need. The condo has lots of storage and was clean… The kitchen was well stocked, and we loved having all the supplies we needed for the beach in the storage closet. My only critique would be that they could update the decor and furniture. The sofas have cheap slip covers on them, and the master bedroom furniture is so big, it is hard to get around the bed. Overall, it was a great experience and we would definitely stay here again. Property was very nice. It is a short walk to the beach and had to cross the highway but had no issues. Owner was always willing to help and was very friendly!! Would love to go back in the future!! Lovely condo within walking distance to the most beautiful beaches in the world. Our family had a wonderful experience. Great condo! They had everything we needed to have a nice relaxing vacation!